Low-brow comedy gives Publicis success with its Plenty and Hula Hoops work. Larger-than-life, stereotyped foreign characters remain a popular ad gag. 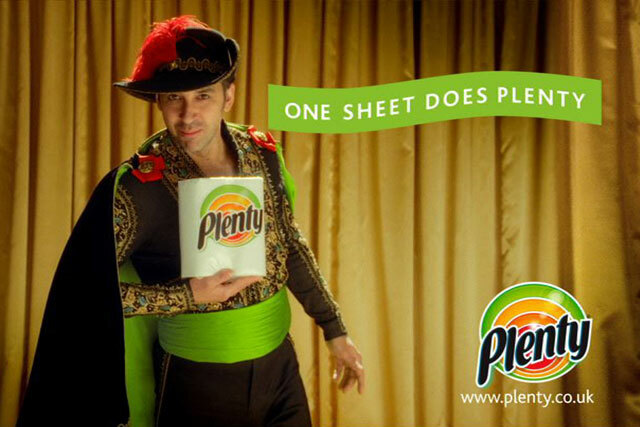 So say those who saw Publicis' campaign for the towel brand Plenty, which stars Latino superhero Juan Sheet. Of the 2,000 people surveyed by OnePoll for Campaign, the ad "Juan Sheet and the juicy lady" was rated the best of ten pieces of the agency's recent work. The spot, in which a man dressed as a Spanish bull-fighter equipped with absorbent kitchen towel rushes to the rescue of a housewife struggling to mop up spilt juice, recorded the admirable average score of 6.13 out of ten. As well as appealing to the target female audience (there is a shot of the housewife ogling Juan's bottom), the ad was, perhaps surprisingly, enjoyed nearly as much by men. On the flip-side, an ad for the Army, which recreates a real-life scenario in the Middle East and poses three choices a soldier can make, was liked more by women. Curiously, the spot was also most popular with the over-55s, suggesting more could perhaps be done to engage young men. Comedy is clearly a strength of Publicis' campaigns. The agency's work for Hula Hoops, which includes the spot where the crisps are fashioned into a DJ finger puppet, entertained the public, who rated it their second-favourite ad. Not surprisingly, the unashamedly juvenile conceit was preferred by 18-to 24-year-olds when it came to how much the ad made them like the crisps brand. The work Publicis has created for Renault had mixed results. Most popular was the Cannes Lions-awarded "12-second strip", part of an integrated campaign for the Renault Wind convertible, which invited the public to upload films of themselves stripping within 12 seconds - the time it takes for the car's roof to fold back. This was given a 6.01 average for how much punters were impressed with the ad. In contrast, though, the updated Renault Clio campaign, "what is va va voom? ", failed to excite, coming in tenth place. The spot, a heavily stylised, arty film featuring Thierry Henry and Dita Von Teese, did not connect with the general public, accumulating an average score of just 4.87. Source: OnePoll Research. Sample: 2,000 people (1,030 female, 970 male).